Lucky or unlucky? Either way she lived to tell the story through her compelling memoirs titled, Titanic Survivor: The Memoirs of a Stewardess. 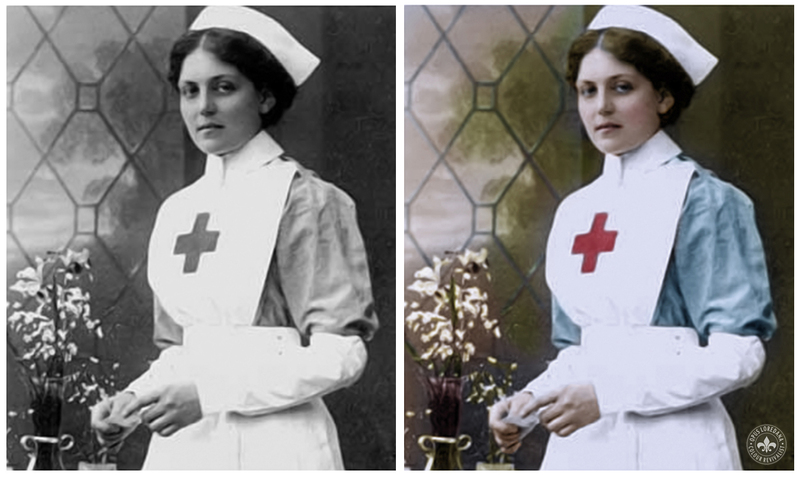 Having overcome life threatening tuberculosis at an early age, Violet Constance Jessop survived the sinking of not one but two ships, the RMS Titanic in 1912 and her sister ship, the HMHS Britannic in 1916. And that was after surviving a major incident on board the luxury liner RMS Olympic, which collided with the protected cruiser HMS Hawke, off the Isle of Wight in 1911. Born in Argentina to Irish immigrants in 1887, Jessop was an ocean liner stewardess and nurse who despite her misfortunes, spent her entire career at sea and went on to live a long and healthy life. Her memoirs give an eye witness account of the night in 1912, the RMS Titanic struck an iceberg in the North Atlantic, and how over the next two hours the ‘unsinkable’ ship broke in two and sank. Over 1500 lives were lost that night. During the First World War, Jessop was serving as a stewardess for the British Red Cross on board His Majesty’s Hospital Ship Britannic, when the ship apparently struck a sea mine and quickly sank in the Aegean Sea off the Greek island of Kea, with the loss of 30 lives. While the Britannic was going down, Jessop jumped out of a lifeboat to avoid being sucked into the Britannic′s propellers and was sucked under the water striking her head on the keel of a lifeboat before surfacing and being rescued. Undeterred from her chosen career path, and as ships were becoming a popular form of transport, she continued working as a stewardess, cruising the world several times. After some forty-two years at sea, Jessop retired in 1950 to a quiet country existence in a sixteenth-century thatched cottage in Great Ashfield, Suffolk, England. Violet Jessop died of heart failure on this day, 5 May 1971 at the age of 84. Written in 1934, her memoirs were published posthumously in 1997. ”I leapt into the water but was sucked under the ship’s keel which struck my head. I escaped, but years later when I went to my doctor because of a lot of headaches, he discovered I had once sustained a fracture of the skull!” Violet Jessop –Titanic Survivor: The Memoirs of a Stewardess. This entry was posted in Colorization, Colourisation, History, Opus Loredana, Photography, Women, Women writers, World War 1 and tagged HMHS Britannic, HMS Hawke, Loredana Crupi, Miss Unsinkable, OpusLoredana, Red Star Line, RMS Olympic, RMS Titanic, Titanic, Titanic Survivor: The Memoirs of a Stewardess, Violet Jessop, White Star Line. Bookmark the permalink. what a nice looking lady, remarkable to have survived!